If you want to grill a tasty and healthy meal you need to plan ahead. Sure, one of the great things about grilling is that you can come home and throw a couple of chops on the grill and have a meal in minutes, but there are four very good reasons why you should take the time and marinate meats before they hit the grill. A marinade can work in as little as 30 minutes to provide many of these benefits, but tougher, thicker cuts of meat may need several hours or most of a day. A good marinade contains flavorings, spices, herbs, etc. Because a marinade is also acidic it carries these flavors into foods. Of course, it can only travel so far, so marinating a thick roast will not get the added flavor you would get with a thin cut, but it is still beneficial. When selecting a marinade look for flavor that will compliment the food you are marinating. Marinades typically contain some kind of oil. Olive oil is my particular favorite. In fact, the best oil to use is a light oil containing mono- and/or diglycerides. These natural emulsifiers help penetrate meats faster than other oils, so check the labels for a good marinade oil. The oil also serves to hold in moisture on meats and to reduce the moisture loss during cooking. This also helps prevent sticking on the grill. When cooking meats over a direct flame heterocyclic amines (HCA)'s are created. These potentially cancer-causing agents can be reduced by, as much at 99% when foods are marinated in an acidic marinade, at least that's what the American Cancer Research Institute says. An acidic marinade acts by keeping HCA's from forming on meats. Where do you get these acids you ask. Acidic liquids can be any kind of vinegar, citrus juices (particularly lemon juice), wine, or even beer. The acids in a marinade acts to break down protein chains in meats, making the meat more tender. However, you need to make sure that you do not let food sit in marinades for too long. Surfaces in direct contact with a marinade can become soft and mushy, not something you would want to serve. This is particularly important with fish and seafood, which can actually cook, in an acidic environment. Do not marinate foods longer than called for. Putting together a marinade is very easy. In fact, one of the simplest solutions to a good marinade is Italian Dressing. Yes, this favorite on the salad makes the perfect marinade because it contains oil and vinegar in equal parts with a good dose of herbs and spice. To make a simple marinade take your oil of choice and add it to an equal part of acid (vinegar, lemon juice, wine, etc.). Now throw in whatever seasonings you like and you are done. Pour the whole thing in a zip-top bag, add the meat and refrigerate until you are ready to cook. Meats like beef and pork should be marinated the longest. Anywhere from an hour to 10 hours depending on the thickness of the cut and the strength of the marinade. 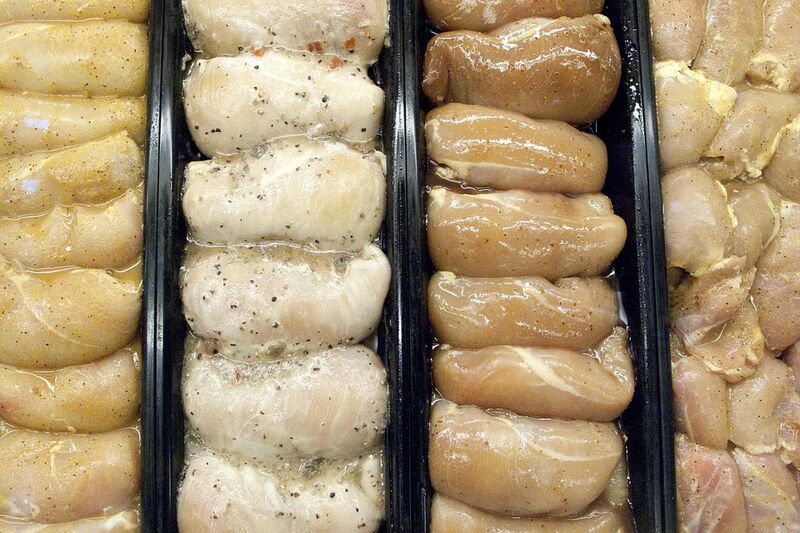 Poultry should be marinated anywhere from 30 minutes to 3 hours. Fish and seafood should spend no more than 30 minutes in a marinade. Be particularly careful with shrimp that can actually cook in a strong marinade. You only need enough marinade to cover the meat completely with a thick layer. It is important to make sure that it is completely covered in the marinade so it can work on the entire exposed surface. You also need to keep meats of any kind refrigerated. Do not let food sit at room temperature any longer than absolutely necessary. When marinating take your food straight from the refrigerator to the grill. If you intend to use your marinade as a sauce after you have taken the meat out of you will need to bring it to a complete boil for 5 minutes before it is safe again. For some marinades, this can actually ruin the flavor so make sure you are following your recipe's instructions.